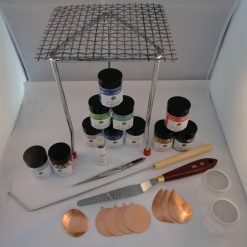 This kit contains everything needed to introduce you to the fascinating and rewarding craft of enamelling. An EFCO 135 enamelling kiln complete with door switch, which cuts the power to the heating element when the door is opened as an extra safety measure. A removable ceramic tile to protect the base of the kiln. The door handle can be in the left or right position. There is a spy hole to view inside the kiln. When firing, the maximum operating temperature is 1100 centigrade. 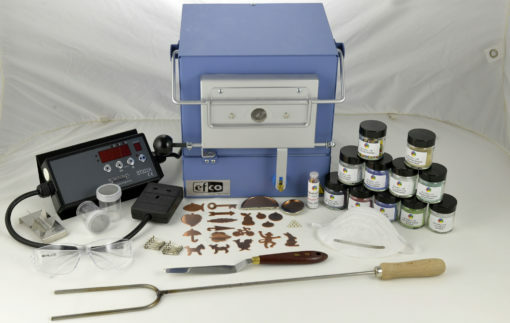 The time to reach the ideal enamelling temperature of 820 centigrade from cold is 30 minutes. 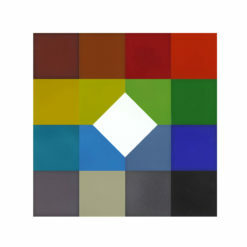 The interior dimensions are 90mm x 140mm x 155mm. The gross weight is 6.3kg. Complete with the operating booklet and 2 year guarantee, a Stafford Instruments Set and Forget Controller. The controller offers you the choice of setting nine programs. It is delivered with “program one set at 820” to be reached in 30 minutes. 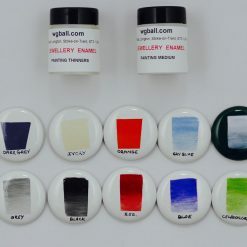 25gm each of a small selection of transparent and opaque enamels for application to copper, gold and silver. 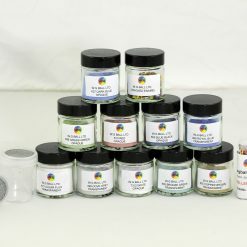 25gm of multi-coloured crushed enamel lumps to give small areas of contrasting colours when placed on a base coat of enamels. A tube of enamel threads, mixed coloured strands of enamel to give straight lines when placed on a base coat of enamel. A selection of copper blanks and brooch pins. Pins are attached by gluing after all enamelling processes. Two shaker tubes to apply the powdered enamel. When changing colour, make sure the mesh is clean from the previous colour. A stainless steel stilt to support the blanks on whilst firing. Always place the piece to be fired on the stilt outside the kiln and then lift into the kiln. An angled spatula for lifting pieces on and off the stilt. A firing fork for lifting pieces in and out of the kiln. An entry level dust mask and safety glasses.